Describe what happens during a phase change. Calculate the energy change needed for a phase change. Substances can change phase—often because of a temperature change. At low temperatures, most substances are solid; as the temperature increases, they become liquid; at higher temperatures still, they become gaseous. The process of a solid becoming a liquid is called melting. (an older term that you may see sometimes is fusion). The opposite process, a liquid becoming a solid, is called solidification. For any pure substance, the temperature at which melting occurs—known as the melting point—is a characteristic of that substance. It requires energy for a solid to melt into a liquid. Every pure substance has a certain amount of energy it needs to change from a solid to a liquid. This amount is called the enthalpy of fusion (or heat of fusion) of the substance, represented as ΔHfus. Some ΔHfus values are listed in Table 10.2 “Enthalpies of Fusion for Various Substances”; it is assumed that these values are for the melting point of the substance. Note that the unit of ΔHfus is kilojoules per mole, so we need to know the quantity of material to know how much energy is involved. The ΔHfus is always tabulated as a positive number. However, it can be used for both the melting and the solidification processes as long as you keep in mind that melting is always endothermic (so ΔH will be positive), while solidification is always exothermic (so ΔH will be negative). What is the energy change when 45.7 g of H2O melt at 0°C? The ΔHfus of H2O is 6.01 kJ/mol. However, our quantity is given in units of grams, not moles, so the first step is to convert grams to moles using the molar mass of H2O, which is 18.0 g/mol. Then we can use ΔHfus as a conversion factor. Because the substance is melting, the process is endothermic, so the energy change will have a positive sign. Without a sign, the number is assumed to be positive. What is the energy change when 108 g of C6H6 freeze at 5.5°C? During melting, energy goes exclusively to changing the phase of a substance; it does not go into changing the temperature of a substance. Hence melting is an isothermal process because a substance stays at the same temperature. Only when all of a substance is melted does any additional energy go to changing its temperature. What happens when a solid becomes a liquid? In a solid, individual particles are stuck in place because the intermolecular forces cannot be overcome by the energy of the particles. When more energy is supplied (e.g., by raising the temperature), there comes a point at which the particles have enough energy to move around but not enough energy to separate. This is the liquid phase: particles are still in contact but are able to move around each other. This explains why liquids can assume the shape of their containers: the particles move around and, under the influence of gravity, fill the lowest volume possible (unless the liquid is in a zero-gravity environment—see Figure 10.3 “Liquids and Gravity”). (a) A liquid fills the bottom of its container as it is drawn downward by gravity and the particles slide over each other. 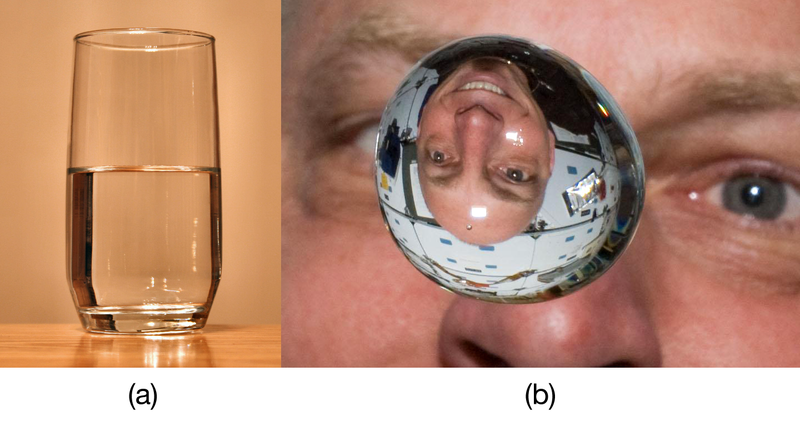 (b) A liquid floats in a zero- gravity environment. The particles still slide over each other because they are in the liquid phase, but now there is no gravity to pull them down. Source: “Glass of Water” by Derek Jensen is in the public domain; “Clayton Anderson zero g” s in the public domain because it was solely created by NASA. The phase change between a liquid and a gas has some similarities to the phase change between a solid and a liquid. At a certain temperature, the particles in a liquid have enough energy to become a gas. 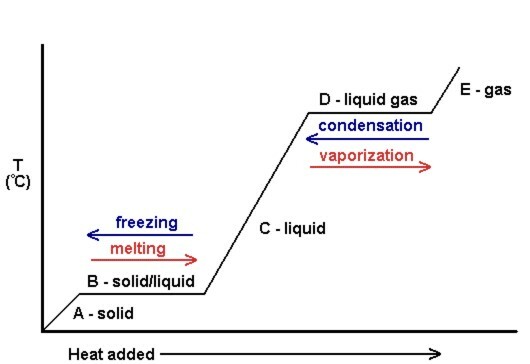 The process of a liquid becoming a gas is called boiling (or vapourization), while the process of a gas becoming a liquid is called condensation. However, unlike the solid/liquid conversion process, the liquid/gas conversion process is noticeably affected by the surrounding pressure on the liquid because gases are strongly affected by pressure. This means that the temperature at which a liquid becomes a gas, the boiling point, can change with surrounding pressure. Therefore, we define the normal boiling point as the temperature at which a liquid changes to a gas when the surrounding pressure is exactly 1 atm, or 760 torr. Unless otherwise specified, it is assumed that a boiling point is for 1 atm of pressure. Like the solid/liquid phase change, the liquid/gas phase change involves energy. The amount of energy required to convert a liquid to a gas is called the enthalpy of vapourization (or heat of vapourization), represented as ΔHvap. Some ΔHvap values are listed in Table 10.3 “Enthalpies of Vaporization for Various Substances”; it is assumed that these values are for the normal boiling point temperature of the substance, which is also given in the table. The unit for ΔHvap is also kilojoules per mole, so we need to know the quantity of material to know how much energy is involved. The ΔHvap is also always tabulated as a positive number. It can be used for both the boiling and the condensation processes as long as you keep in mind that boiling is always endothermic (so ΔH will be positive), while condensation is always exothermic (so ΔH will be negative). What is the energy change when 66.7 g of Br2(g) condense to a liquid at 59.5°C? The ΔHvap of Br2 is 15.4 kJ/mol. Even though this is a condensation process, we can still use the numerical value of ΔHvap as long as we realize that we must take energy out, so the ΔH value will be negative. To determine the magnitude of the energy change, we must first convert the amount of Br2 to moles. Then we can use ΔHvap as a conversion factor. Because the process is exothermic, the actual value will be negative: ΔH = −6.43 kJ. What is the energy change when 822 g of C2H5OH(ℓ) boil at its normal boiling point of 78.3°C? As with melting, the energy in boiling goes exclusively to changing the phase of a substance; it does not go into changing the temperature of a substance. So boiling is also an isothermal process. Only when all of a substance has boiled does any additional energy go to changing its temperature. What happens when a liquid becomes a gas? We have already established that a liquid is composed of particles in contact with each other. When a liquid becomes a gas, the particles separate from each other, with each particle going its own way in space. This is how gases tend to fill their containers. Indeed, in the gas phase most of the volume is empty space; only about 1/1,000th of the volume is actually taken up by matter (Figure 10.4 “Liquids and Gases”). It is this property of gases that explains why they can be compressed, a fact that is considered in Chapter 6 “Gases”. In (a), the particles are a liquid; the particles are in contact but are also able to move around each other. In (b), the particles are a gas, and most of the volume is actually empty space. The particles are not to scale; in reality, the dots representing the particles would be about 1/100th the size as depicted. As such, ΔHsub is not always tabulated because it can be simply calculated from ΔHfus and ΔHvap. There are several common examples of sublimation. A well-known product—dry ice—is actually solid CO2. Dry ice is dry because it sublimes, with the solid bypassing the liquid phase and going straight to the gas phase. The sublimation occurs at temperature of −77°C, so it must be handled with caution. If you have ever noticed that ice cubes in a freezer tend to get smaller over time, it is because the solid water is very slowly subliming. “Freezer burn” isn’t actually a burn; it occurs when certain foods, such as meats, slowly lose solid water content because of sublimation. The food is still good but looks unappetizing. Reducing the temperature of a freezer will slow the sublimation of solid water. No chemical change is taking place; however, a physical change is taking place. A plot of the temperature versus the amount of heat added is known as a heating curve (Figure 10.5). These are commonly used to visually show the relationship between phase changes and enthalpy for a given substance. Figure 10.5. Generic heating curve diagram. In Figure 10.5, the solid gains kinetic energy and consequently rises in temperature as heat is added. At the melting point, the heat added is used to break the attractive intermolecular forces of the solid instead of increasing kinetic energy, and therefore the temperature remains constant. After all the solid has melted, once again, the heat added goes to increasing the kinetic energy (and temperature) of the liquid molecules until the boiling point. At the boiling point, once again, the heat added is used to break the attractive intermolecular forces instead of supplying kinetic energy, and the temperature remains constant until all liquid has been turned to gas. Phase changes can occur between any two phases of matter. All phase changes occur with a simultaneous change in energy. All phase changes are isothermal. What is the difference between melting and solidification? What is the difference between boiling and condensation? Describe the molecular changes when a solid becomes a liquid. Describe the molecular changes when a liquid becomes a gas. What is the energy change when 78.0 g of Hg melt at −38.8°C? What is the energy change when 30.8 g of Al solidify at 660°C? What is the energy change when 111 g of Br2 boil at 59.5°C? What is the energy change when 98.6 g of H2O condense at 100°C? Each of the following statements is incorrect. Rewrite them so they are correct. a) Temperature changes during a phase change. b) The process of a liquid becoming a gas is called sublimation. 10. Each of the following statements is incorrect. Rewrite them so they are correct. a) The volume of a gas contains only about 10% matter, with the rest being empty space. b) ΔHsub is equal to ΔHvap. 11. Write the chemical equation for the melting of elemental sodium. 12. Write the chemical equation for the solidification of benzene (C6H6). 13. Write the chemical equation for the sublimation of CO2. 14. Write the chemical equation for the boiling of propanol (C3H7OH). The ΔHsub of I2 is 60.46 kJ/mol, while its ΔHvap is 41.71 kJ/mol. What is the ΔHfus of I2? Melting is the phase change from a solid to a liquid, whereas solidification is the phase change from a liquid to a solid. The molecules have enough energy to move about each other but not enough to completely separate from each other. a) Temperature does not change during a phase change. b) The process of a liquid becoming a gas is called boiling; the process of a solid becoming a gas is called sublimation. Phase Transitions: Melting, Boiling, and Subliming by David W. Ball and Jessie A. Key is licensed under a Creative Commons Attribution-NonCommercial-ShareAlike 4.0 International License, except where otherwise noted.